Claude El Khal is organizing a fundraiser for his blog on Wednesday October 11 - please read the details here. 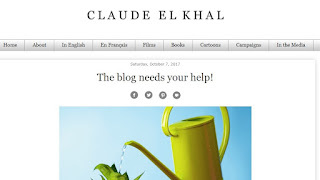 I myself am an avid reader of Claude's blog, and both of us do not accept ads or sponsored content on our pages. A risky move in today's world, trust me, at a time when - as a blogger - you are expected to do such practices (and yes, I still get offers weekly to be an "ambassador" or to have so and so put sponsored content and what not). Some of you might remember my #sharmoutAD tag - sharmouta being a whore in Arabic and AD means Ad Agencies. Both Claude and myself have worked in the advertising world long enough to understand the deep meaning of this word - and my public spat with other bloggers, whereas it healed with time - is still based on that principle: My readers are not for sale. For the sake of transparency, in 2011, I got a cheque from someone who grew to become a friend to (and I am quoting verbatim) "keep doing whatever you are doing". In "retaliation" I offered him one of my most valuable possessions, all the works left from my first exhibition "SupermARTket" which was held in 2002 at the now defunct Espace SD gallery. Even today, if someone wishes to offer me the same kind of cheque, considering it comes with no string attached (meaning, the-cheque-is-for-you-to-give-a-positive-opinion-about-our-ads-from-here-on) I am not going to reject it. I understand where Claude is coming from - and we both have the same quantitative amount of readership he speaks of on his page - but maybe this is where him and I differ. I still see blogging as a personal decision I undertook in 2007, I still see it as an effort (or rather obsession) I have decided to do myself, and despite all the happenings and non-happenings in my life since 2007 the blog stood strong (even if at times the way to update it was so frighteningly convoluted it made almost no sense to have done it). I respect Claude immensely, and do read his opinions as soon as he posts them. But I am not going to do crowdfunding or fundraisers for the blog. I wish him incredible success in his endeavors and totally get the place he is at - what started as a side "hobby" grew so much it took over his life. Claude is a valuble voice in our community. I am just helping him spread the word about the event!